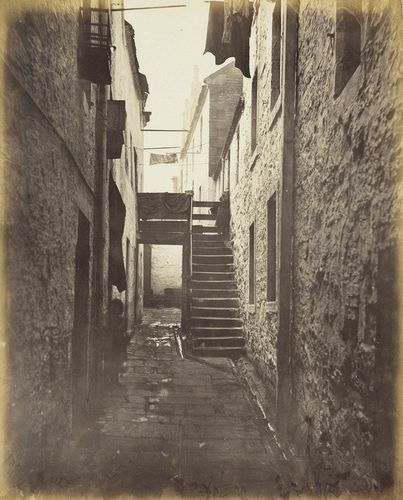 In 1868 the Fife-born photographer, Thomas Annan, began his series of thirty-one photographs of the closes and wynds of old Glasgow. This area was one of the worst urban slums in Britain and had recently been scheduled for demolition by the City Improvement Trust, a body set up by the Glasgow Improvement Act of 1866 with sweeping powers to clear property. Annan was charged by the Trustees with recording its passing, an antiquarian commission that answered an anxiety about the city’s rapid pace of change. Facing technical problems due to the dark and dank conditions, he utilised the wet collodion process, the most sensitive technology then available. The series is acknowledged as the first record of slum housing in the history of photography.